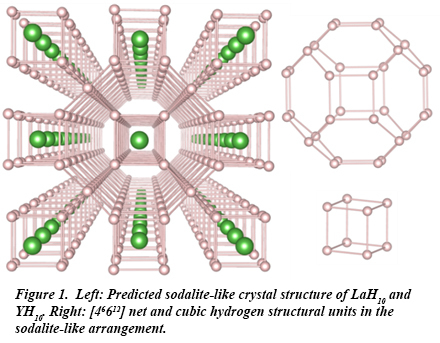 Carnegie scientist Hanyu Liu and colleagues have been investigating the high-pressure crystal structures of potentially superconducting metal hydrides using theoretical modeling. To date, the simple hydrides with the highest predicted superconducting transition temperatures (Tc) are MgH6 (271 K at 300 GPa), CaH6 (235 K at 150 GPa), and YH6 (264 K at 120 GPa). Recent work from scientists at Carnegie and Cornell has resulted in the prediction of two new, potentially superconducting hydrides of lanthanum and yttrium with remarkably high Tc at attainable pressures.